White layer is 3-3/4 x 5-1/2 and die cut using the Fancy Cutout Border. I then die cut the Circle Shaker Frame and used only the two outer layers. I sponged the inner layer with Distress Oxide Black Soot ink and the outer layer with Distress Oxide Mermaid Lagoon and embossed the Mermaid Lagoon piece only. I stamped this little mouse image and colored it in. The Circle Shaker Frame was then mounted over the mouse image which I hand cut to fit behind the frame. Finally, adhere the white layer to the pink card base. 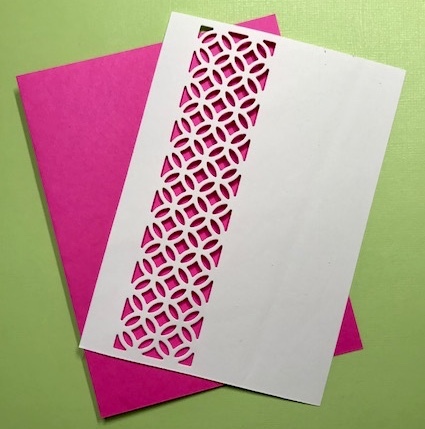 Place your mouse layers on the front of the card using 3-D foam squares. I also added some glossy accents to the heart and Black Nuvo Crystal drops to mouse eyes for more dimension. Stamp your sentiment and fussy cut it out then layer it on the same pink card stock and fussy cut that as well. The final touch is a one inch bow on the mouse head. 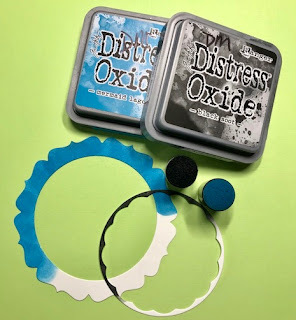 I hope this inspires you to use some of the fantastic dies on the Dies R Us website as well as their consumables. Please remember, each an every day of the month there's a new inspiration sample shared on the blog by this fabulous design team. Please be sure to pop in regularly. Also, don't forget to come join in the fun at the Dies R Us Challenge Blog. There's a new challenge theme offered on the 1st and 15th of each month and one lucky randomly drawn winner will receive a gift voucher prize to the Dies R Us Store.